In 2013, the Australian Department of Foreign Affairs and Trade (DFAT) in consultation with the Government of Tuvalu, non-government agencies and communities, formulated the Tuvalu Pacific Women Country Plan (2015–2018). The country plan, endorsed by the Government of Tuvalu, outlined the Australian Government’s commitment to spend up to $1.8 million over three years on initiatives that support gender equality in Tuvalu. 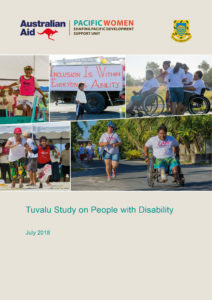 One of the key activities identified in the Tuvalu Pacific Women Country Plan is to support the Tuvalu Disabled Persons Organisation, Fusi Alofa Association of Tuvalu (FAA) and the Ministry of Home Affairs to conduct a disability study. The intention of the study was to collect information about the experiences of persons with disability and their carers. It was to create a holistic picture of the challenges experienced in their everyday life. The study was a collaborative effort between the Ministry of Home Affairs, the Gender Affairs Department of the Office of the Prime Minister and the FFA. Field workers interviewed 466 persons with a disability living in the country. Almost half said that their disability prevented them from participating in family and community events, largely due to physical barriers. Health facilities were inaccessible to around half of the participants and stigma, discrimination and abuse were experienced by many people with disabilities and were noted to have a strong impact on their lives. Furthermore, women with disabilities are also twice as likely to live in hardship compared to men with disabilities. It was also emphasised that women also carry the majority of the burden as caregivers.